Since starting blogging I have met some really lovely people, two of which are Kam and Angie. 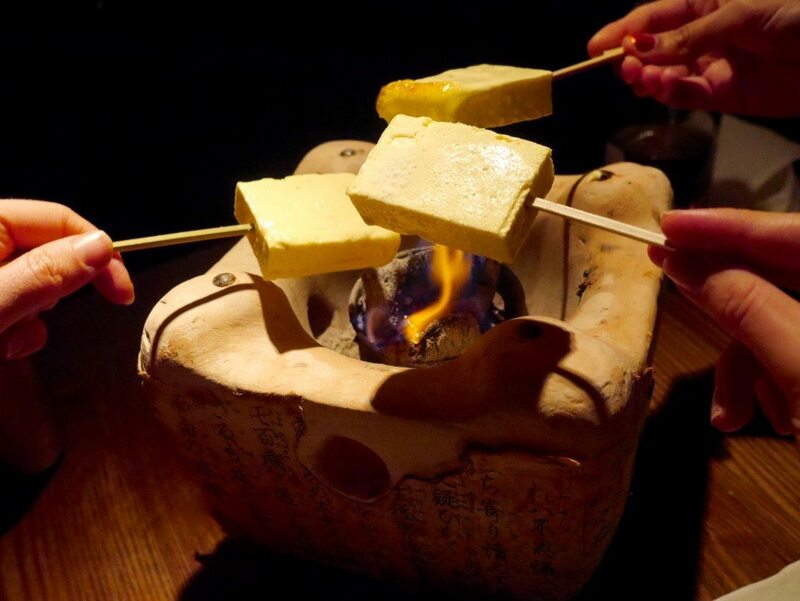 After emailing to-and-fro about a venue worthy of our first group date, we settled on Flesh & Buns, a Japanese Izakaya bar & restaurant, which focuses on serving simple dishes that can be enjoyed whilst drinking. 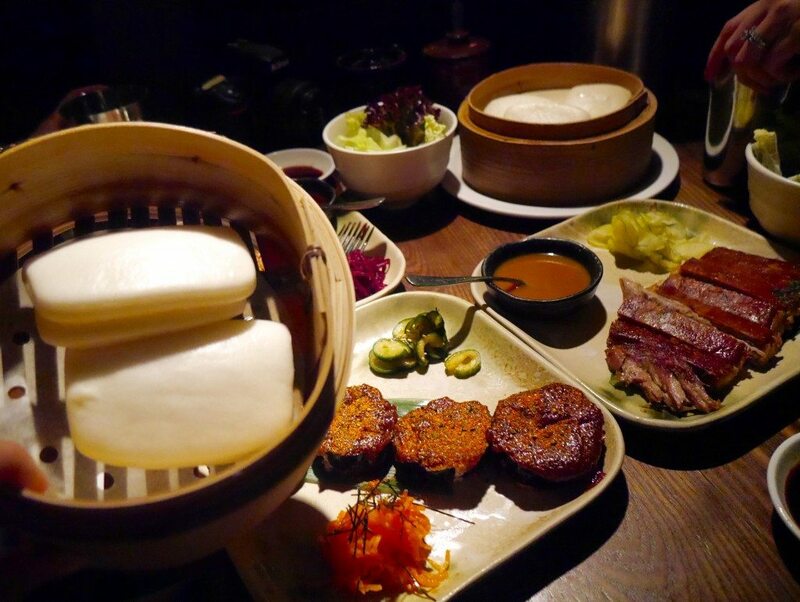 Although, as its name suggests, what it’s most renowned for is its DIY steamed buns, which you fill yourself with the ‘flesh’ (meat or fish) of your choice. Service: Service was on point. Depending on the time that you rock up, you will either be shown straight to your table or invited to wait at the bar. Naturally, we arrived with time for a pre-meal tipple. I’d already had the pleasure of meeting Kam for brunch at Granger & Co., but I must admit that upon embracing Angie for the first time, I was totally taken aback by her voice, not because it’s in any way unusual, but it was simply not at all what I had imagined her sounding like. Can anyone relate?! Anyway, once I’d gotten over this, we set about ordering some much sought-after drinks. Kam and Angie had a glass of prosecco (£4.90 each, of which Angie had two), whilst I had a cosmopolitan (£9.00). When making the reservation, I had requested that we be seated at a table versus the long communal benches, as I find tables more intimate & private, and God knows we had a lot to talk about! The staff had responded that they “couldn’t make any promises”, and repeated this when I reminded them of my request in person, however, I was delighted when they accommodated my wish and we got, not just a table, but a table with a spotlight directly above it (#bloggerjoys)! Food was served promptly, and I would recommend informing your waiter that you are in no rush if you want to take the evening slow, as otherwise I can imagine the food easily beginning to arrive a little too promptly for a relaxing meal. 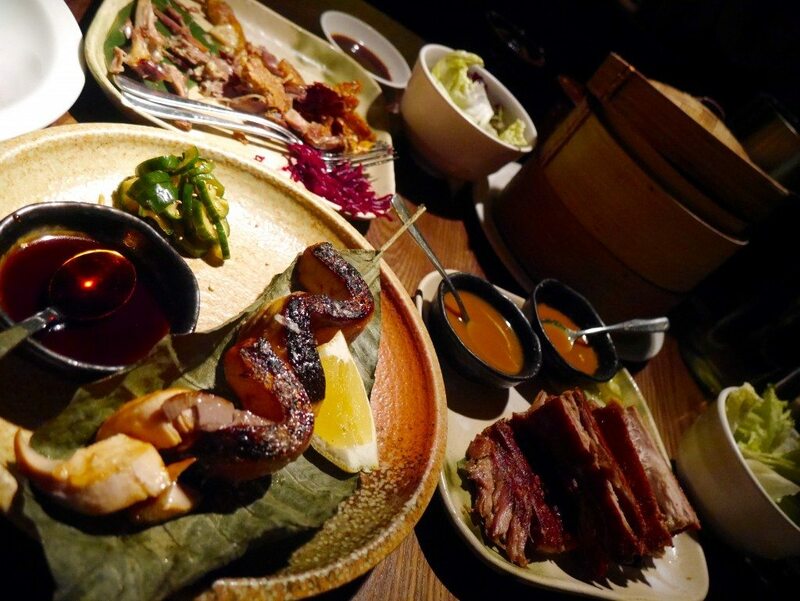 (Much like at any other restaurant built on sharing plates, such as Opera Tavern, Roka, 8 Hoxton Square, Dishoom, Eight over Eight, Sushisamba, Oka or Yauatcha.) Our waiter was nice enough, although a little wary of our table once I’d shot him down for telling us that we shouldn’t order the few extras that we wanted in addition to our tasting menus – unfortunately for him, this happened last time I visited Flesh & Buns, and it irritated me to no end, as we then ended up having to wait some time for our orders later on in the evening. Never underestimate the expandability of my stomach, or any food blogger’s, for that matter! That aside, he put up with our constant food paparazzi’ing, topped up our water & bubbles, and didn’t rush us out of the door; an overall solid performance. 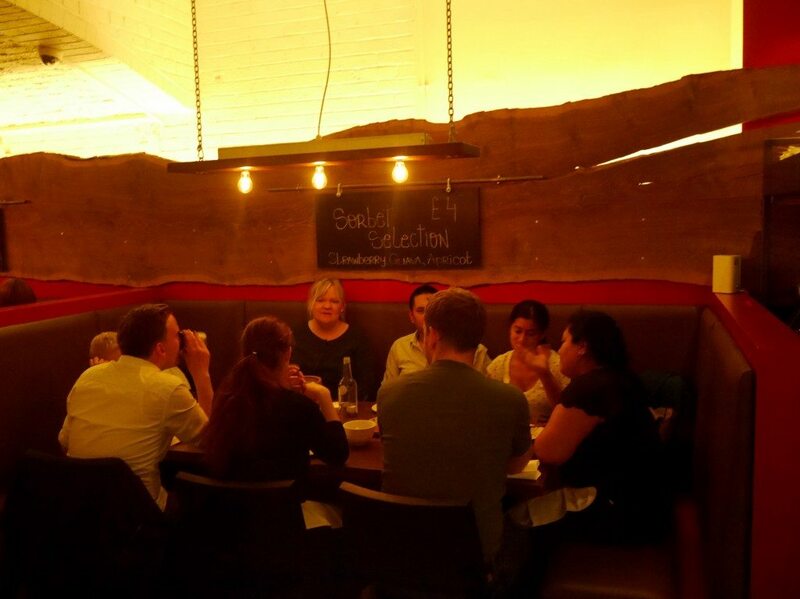 Ambience: Flesh & Buns is a basement restaurant with no natural light. The yellow lighting gives the room some warmth, although one could easily be forgiven for calling it a little dingy, with its painted white brick celling, exposed light cables and steel dome lampshades. 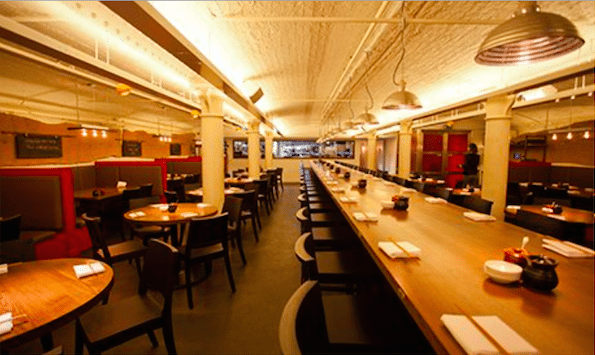 As previously mentioned, seating options include high communal benches, large banquettes or round tables. If it weren’t for the room full of bodies, the ‘bare bones’ approach wouldn’t make for the nicest place to dine, in my opinion. 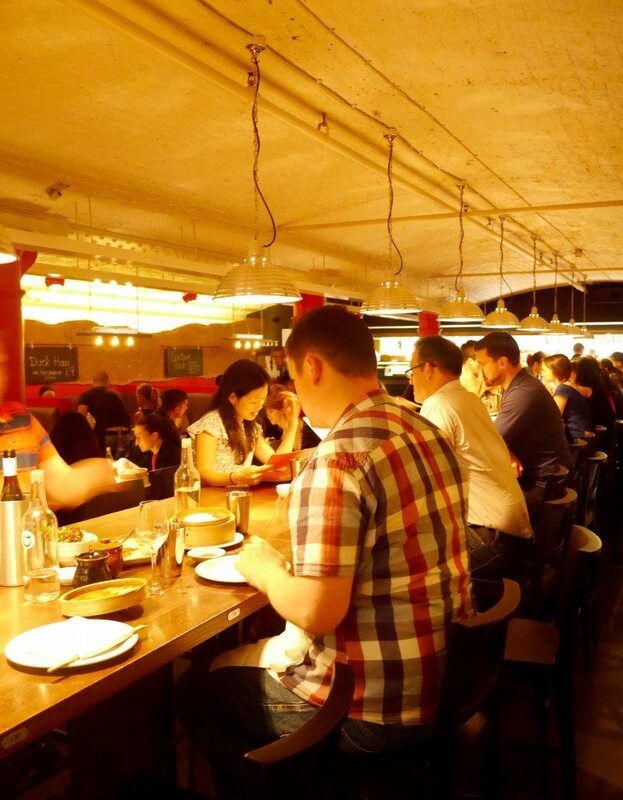 Perhaps the décor, or lack thereof, should be excused on the basis that Flesh & Buns has tried to create an authentic Japanese Izakaya in London. But, if this is the case, then I would expect the “drinking venue, with drinking food”, to have more than a tiny bar with only a handful of stools placed awkwardly at the back of the room. The two don’t quite seem to add up. There was, however, a relaxed, buzzy atmosphere, courtesy of the full house and classic Rock n’ Roll playing in the background. 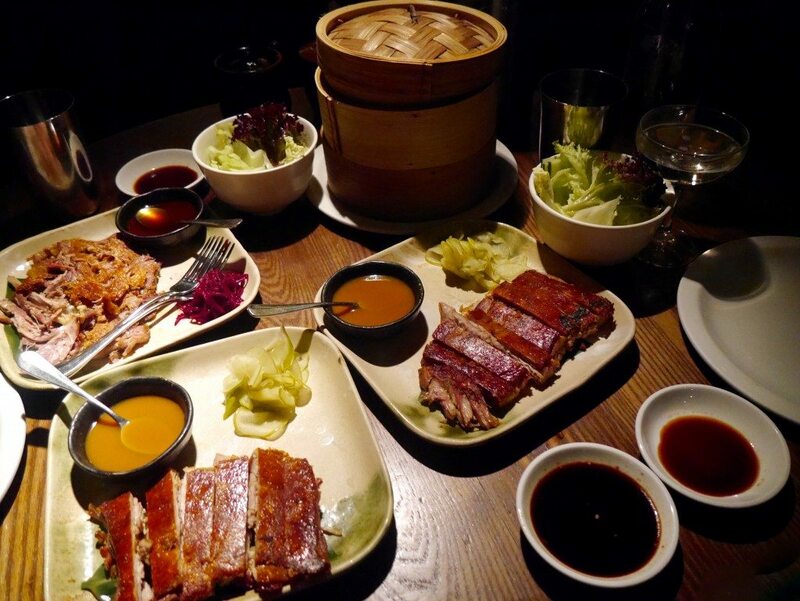 Food: The normal menu is categorised into ’raw and snacks’, ‘small dishes’, and the famous ‘flesh & buns’ sections. I tend to avoid tasting menus on the basis that they’re overpriced and often contain dishes that I don’t particularly want, but Flesh & Buns’ tasting menu overcame both those hurdles with ease; it’s an absolute steal at £35pp, with every dish offered being one that I would otherwise order. The only caveat being that if one person selects it, the whole table has to hop aboard too. Thus, Kam, Angie & I ordered 3 tasting menus, plus some extras that caught our eye (against our waiter’s recommendation), but I’m pleased to say that we finished the lot, bar a few slices of the piglet belly! The tasting menu kicked off nicely, with a glass of prosecco for each person. 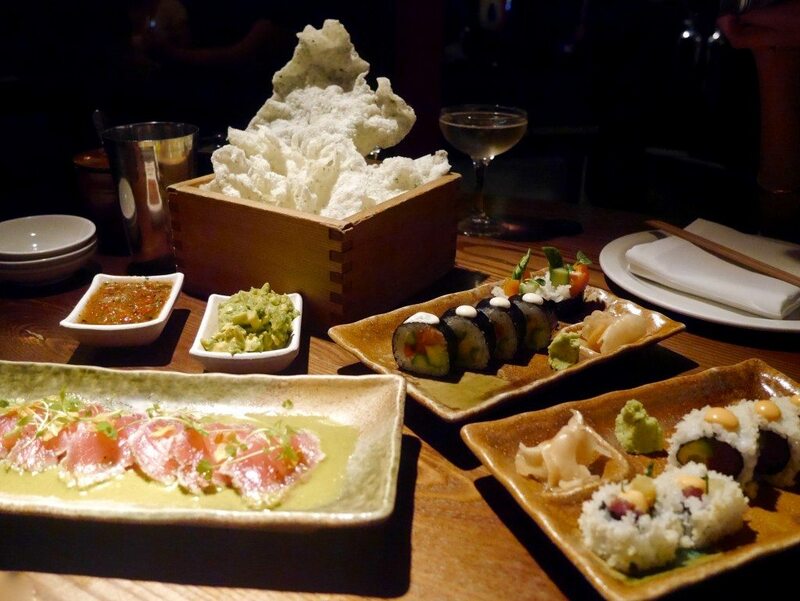 As for food, first up was a few dishes from the ’raw and snacks’ section; ‘chips & dips’ (rice crackers, avocado shiso, tomato jalapeno), a salmon avocado roll, and tuna tataki. 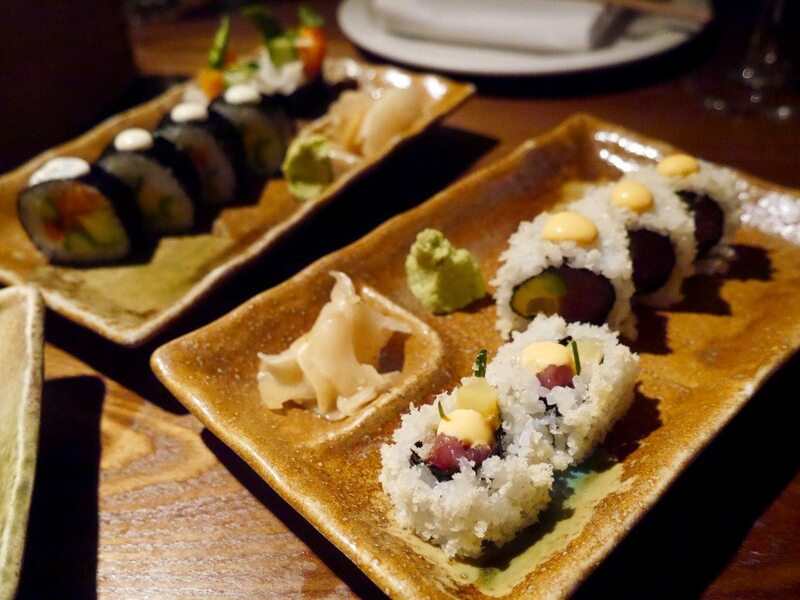 We added a spicy tuna roll (£8.80) too. I found the ‘chips & dips’ rather underwhelming. The rice crackers were soft and floury, reminding me of cheap and stale prawn crackers. The accompanying avocado shisho & tomato jalapeno were equally as unimpressive, with the avocado dip fresh but bland, and the tomato jalapeno watery and lacking bite. 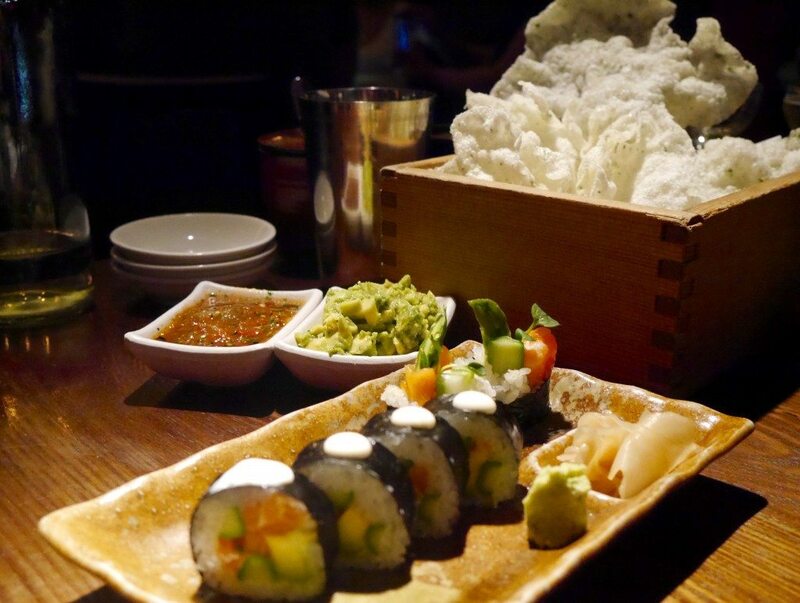 However, it was all up from thereon, with the salmon avocado roll being better than decent, and even better than Roka’s version, which incorporates asparagus. 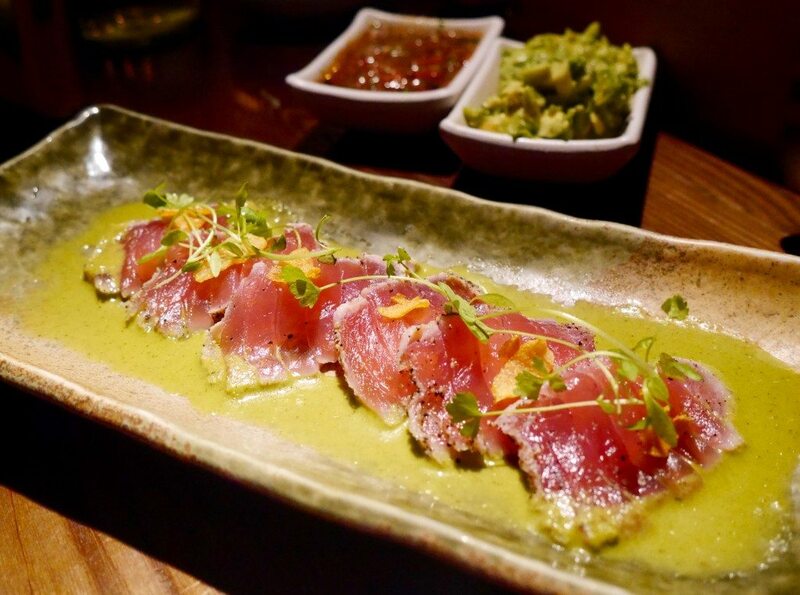 The tuna tataki was fresh & flavoursome, sitting atop a delicious citrusy jalapeno ponzu. The tuna had been skillfully sliced and the quality of the fish was notable, particularly in comparison to the same dish which Angie & I had more recently at Oka. The spicy tuna roll, however, was the star of the show, and definitely worth the additional order; each piece was generously filled with tuna, had a slight crunch, and just a dab of moreish, tasty sauce. I highly recommend ordering this dish if you visit Flesh & Buns. Before we knew it our inclusive glasses of prosecco had run dry and, choosing to stick with the bubbles, we ordered a full bottle of ‘Prosecco di Valdobbiadene, Vaporetto DOC, Italy’ (£28.50). 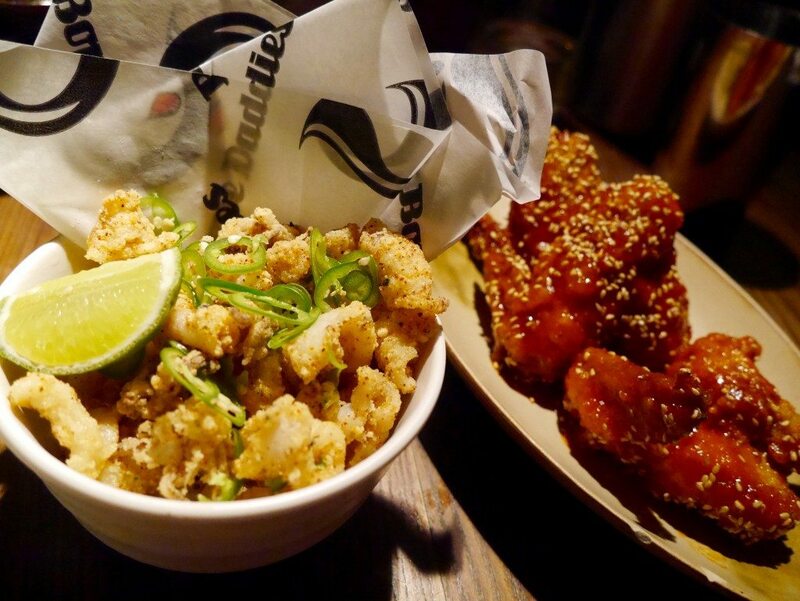 Our next course featured two items from the ‘small dishes’; fried squid and Korean fried wings. The fried squid was well-cooked & seasoned; peppery and seriously delectable with a good squeeze of lime, and dunked in yuzu mayo (requested by the sauce Queen). 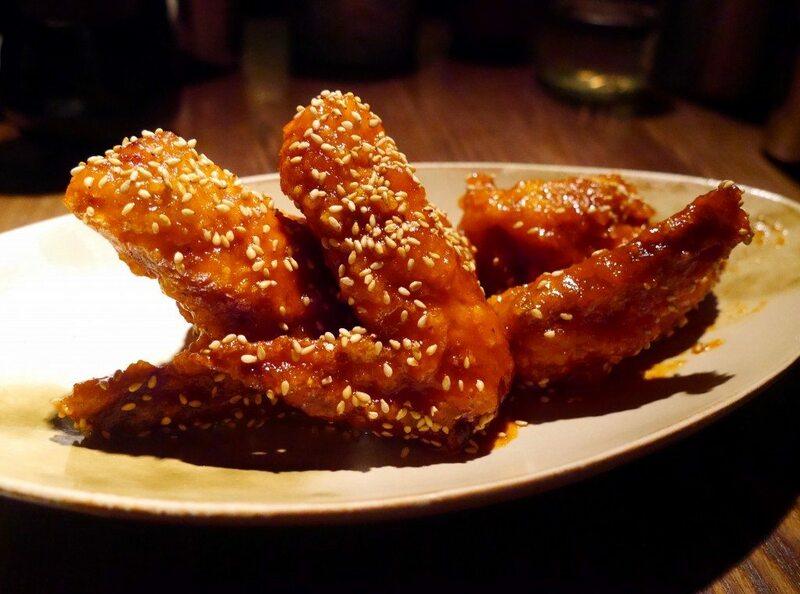 The Korean fried wings were OK. Despite polishing off both Angie’s & mine, the spicy sour sauce was too sweet, and the skin should have been crisp instead of slightly soggy. 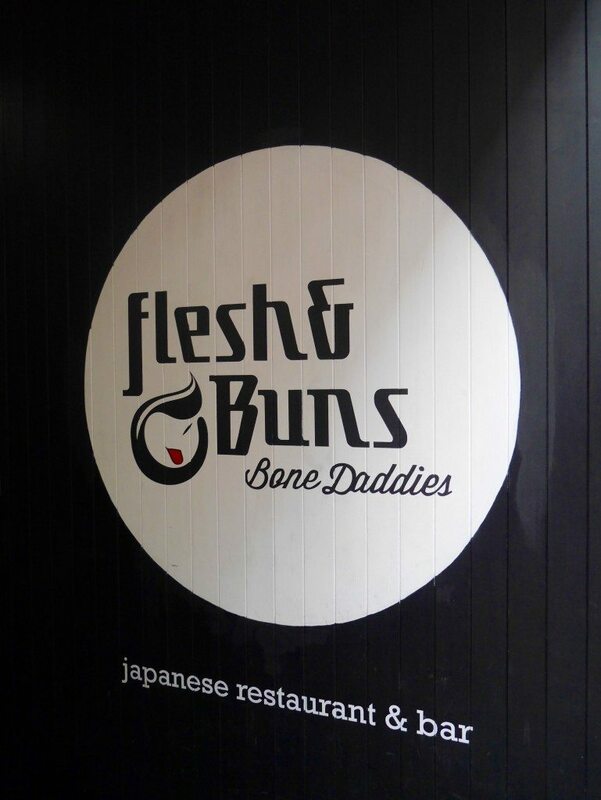 Then, at long last, arrived the much-anticipated ‘flesh and buns’. 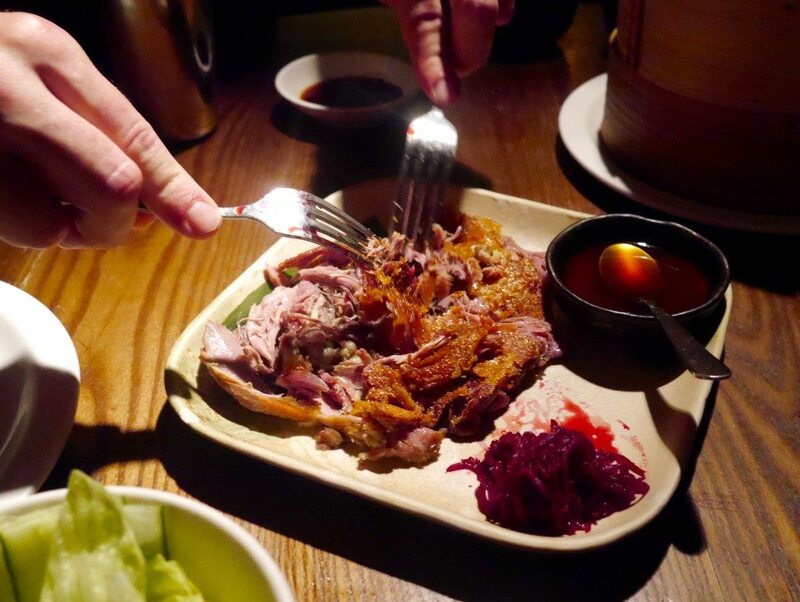 The two types of ‘flesh’ included were crispy duck leg with sour plum sauce & beetroot pickle, and crispy piglet belly with mustard miso & apple pickle. These were served with two steamed buns per person, plus lettuce, sliced cucumber, sauce and pickles, so that you can “custom build your bun the way you like it”. 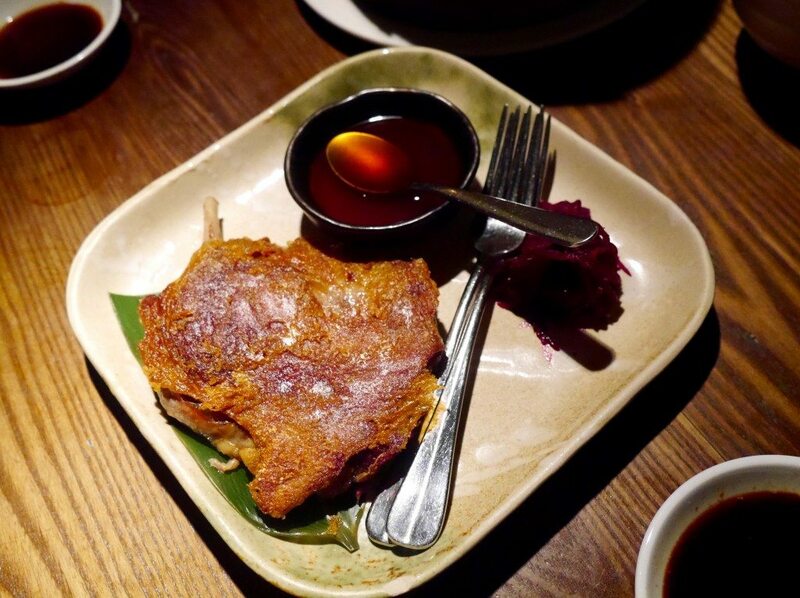 Our server carved the crispy duck leg at the table, which is always a show that I rather enjoy watching! 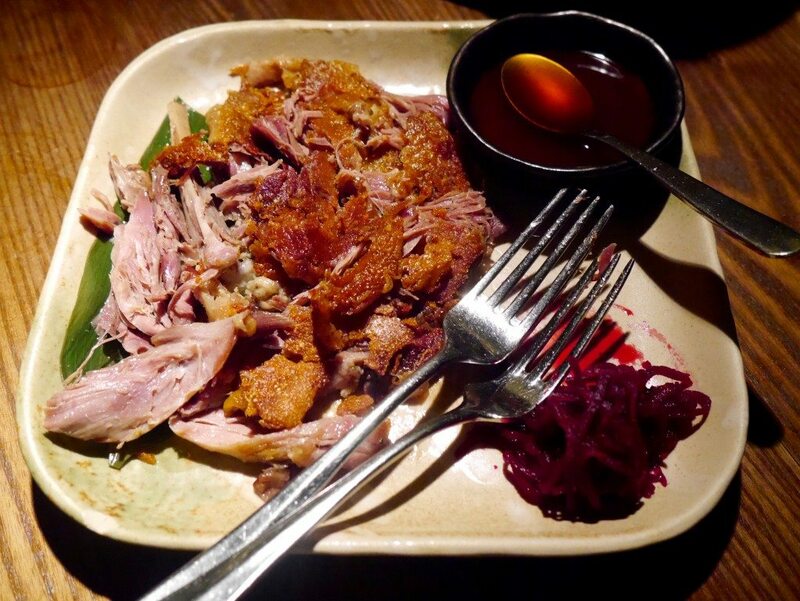 However, the resultant shredded duck was unfortunately very dry, and had nothing on the succulent, crispy-skinned duck that Michael and I enjoyed at Yauatcha last weekend. The crispy piglet belly, on the other hand, was excellently executed; the meat juicy with thick slabs of chewy-crisp crackling, and no off-putting unrendered fat in sight (take note Portland!). It even gave the amazing pork belly dishes at Eight over Eight, Bob Bob Ricard and Sushisamba a run for their money. Hence, I chose to pack the majority of my buns with this piggy delight. The accompanying mustard miso & apple pickle could not have complemented the meat better, making every mouthful a flavour sensation that I simply couldn’t get enough of (Angie doesn’t know what she missed out on!). 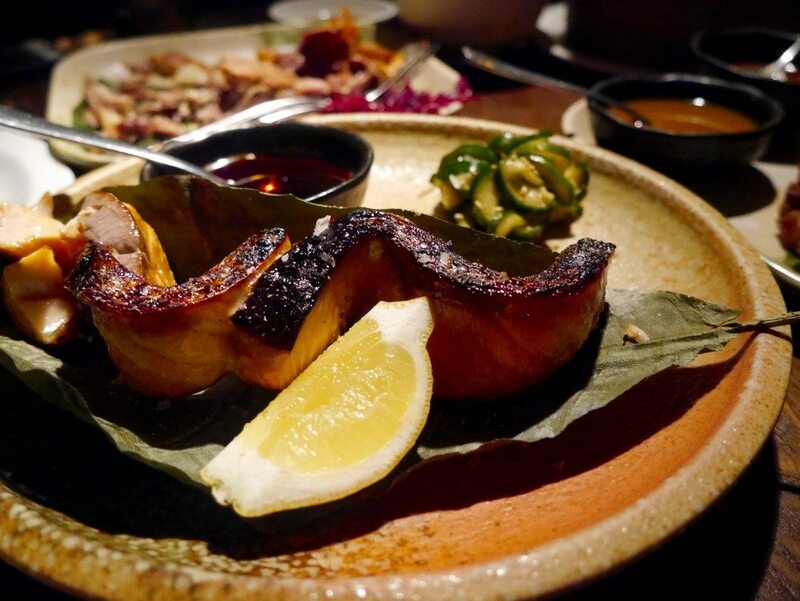 Since Angie is much more into fish than meat, and Kam and I were also keen to try some fish ‘flesh’, we ordered the salmon teriyaki with lemon, sea salt & pickled cucumber (£14.50), as well as some miso grilled aubergine (£9.30), because who can say no to miso grilled aubergine? The salmon teriyaki was nicely presented, but that’s about all the praise that I had for this dish. I love both salmon and teriyaki sauce, and particularly the two combined, but I personally thought that the salmon lacked any distinct teriyaki flavour, or the sticky glaze that should be produced from cooking with this sauce. Instead, I found the salmon very fishy, like bad – old – fishy. However, Angie happily devoured the lot, so I’m pleased that we all got to eat dishes that we enjoyed. The miso grilled aubergine sadly turned out to be a let-down for all three of us. Despite the aubergine being well-cooked, the miso sauce was far too sweet, and had been ladened on so thick that it had congealed into a layer of gloop on top of each slice. Flesh & Buns could really do with asking Roka for tips on this one, as they have fried aubergine with miso sauce down to a tee; I swear to God, it might even be my favourite dish on their entire menu (aside from black cod, of course). Hence I couldn’t resist ordering it twice during both my first & second reviews. 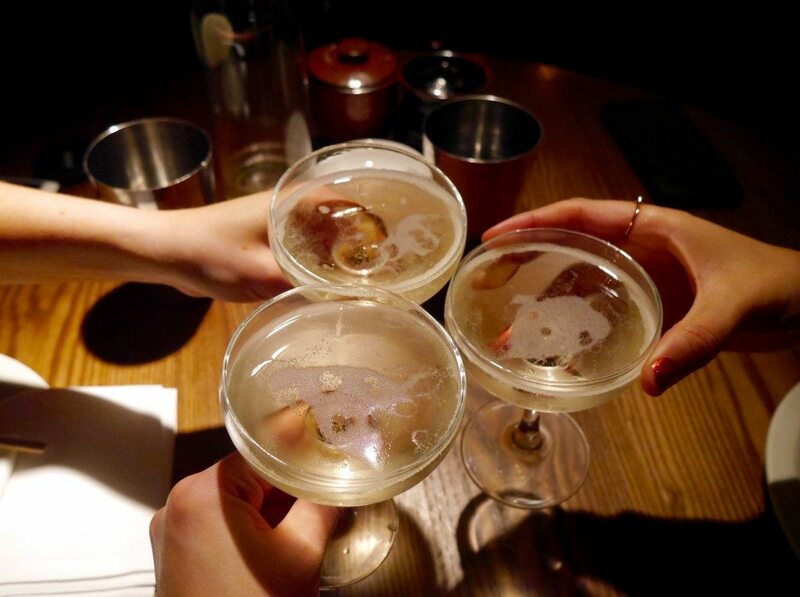 Miraculously, our bottle of bubbles had somehow emptied and, full of good excuses… “it’s Friday”, “we’re celebrating meeting one another”, “if we’re going to have another glass, we might as well go the whole hog”, etc. etc… ordered yet another bottle of ‘Prosecco di Valdobbiadene, Vaporetto DOC, Italy’ (£28.50), to accompany our sweet treat. 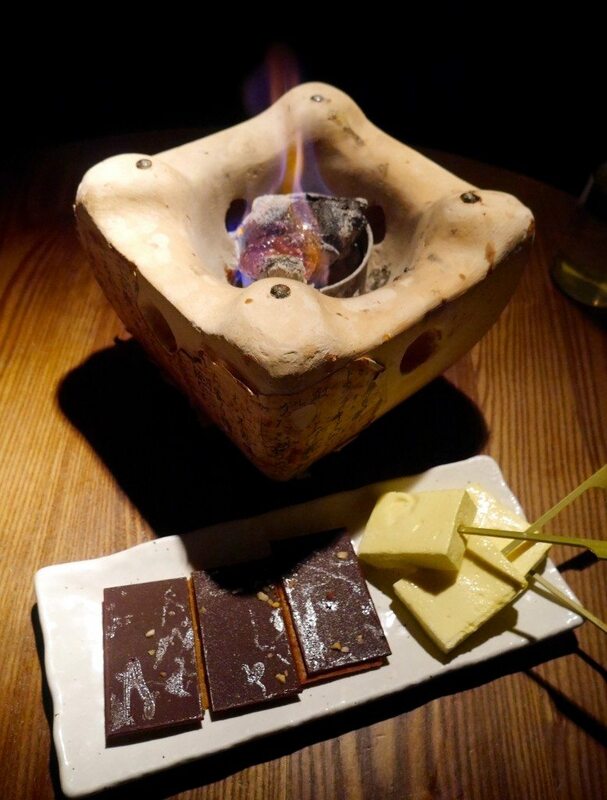 For dessert, the tasting menu provided the Insta-famous s’mores, which allows diners to relive their childhood camping memories and melt their own goo-ey, chocolate-y, crunchy, sticky mess. 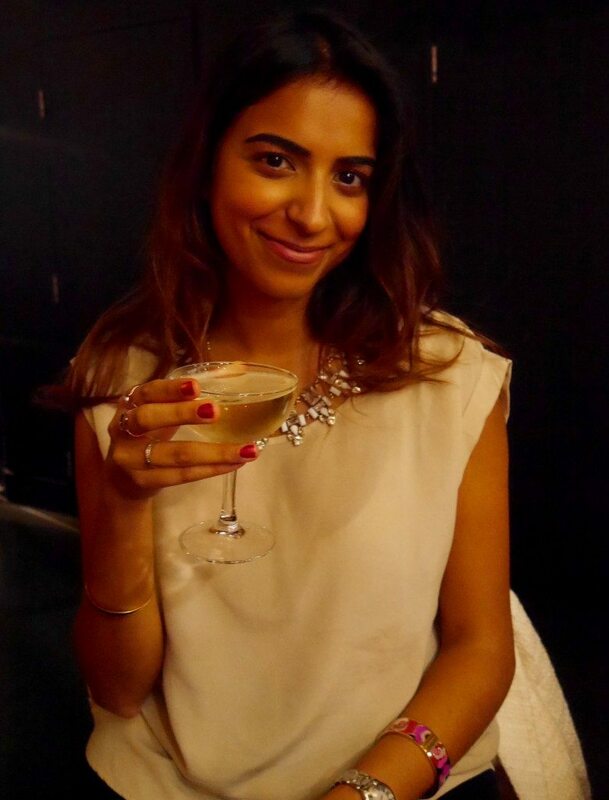 Price: The bill with service came to £245.59 (£81.86 each), for 3 tasting menus, 1 extra small plate, and 2 extra large plates of food, as well as 3 glasses of prosecco, 1 cosmopolitan, and 2 bottles of prosecco. Considering our additional orders of food weren’t strictly necessary, and we drank like de-hydrated fish all night, I thought the value was superb. However, it was ordering the tasting menus that really saved us the big bucks, as opting to pick-n-mix from the usual menu would easily have doubled our food bill, so bear that in mind if you’re planning a visit of your own! What a fun night!! I’d happily do it all again especially the s’mores! 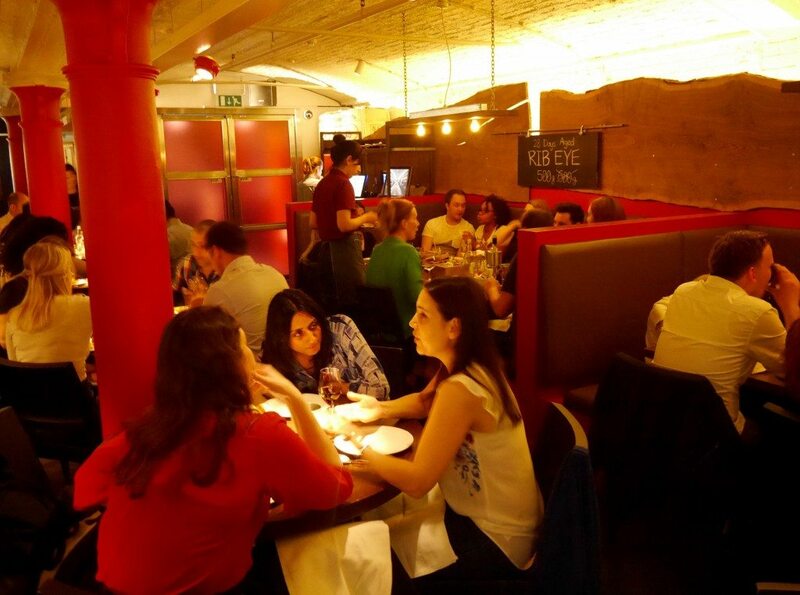 Actually it really is the perfect restaurant for trying lots of things and sharing. Sounds like an interesting bunch of good points and bad! 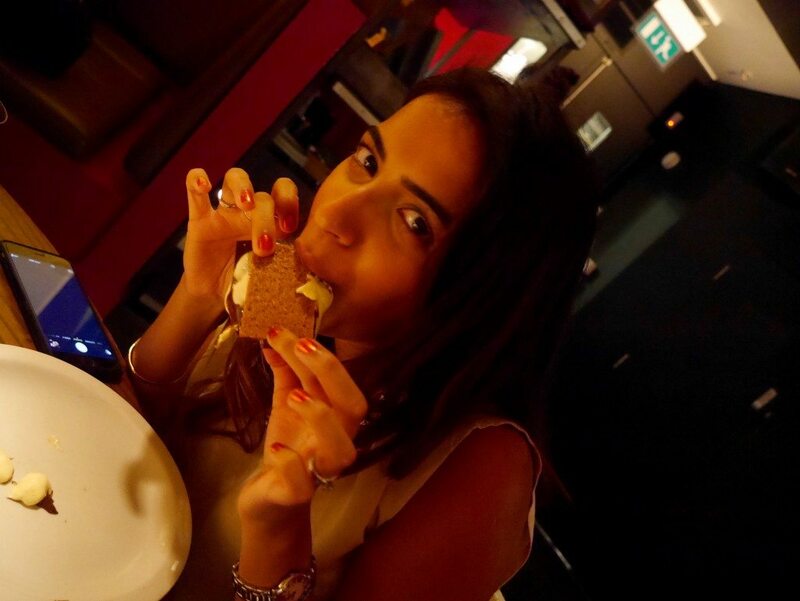 I loved all the small plates/ starters when I went.. but didn’t like the actual burgers at all! 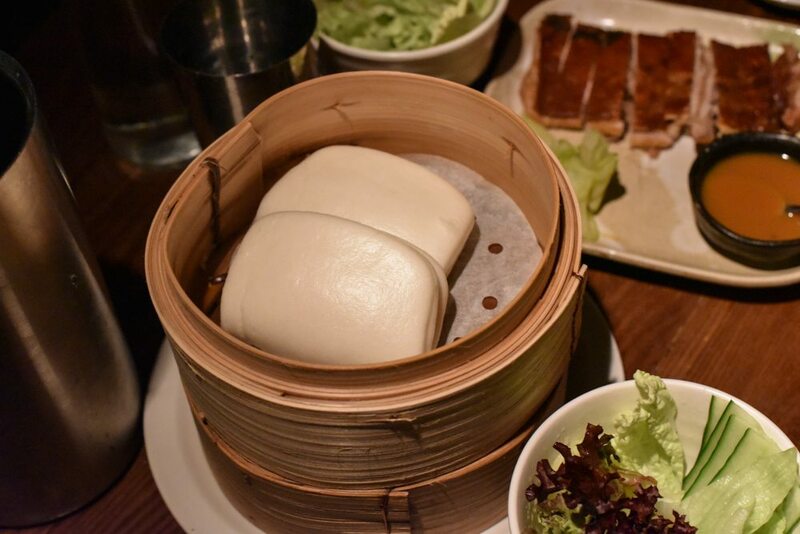 I’m a big fan of steamed buns and with so many restaurants doing them these days I’m so spoilt for choice, hence never actually making it to Flesh and Buns yet! 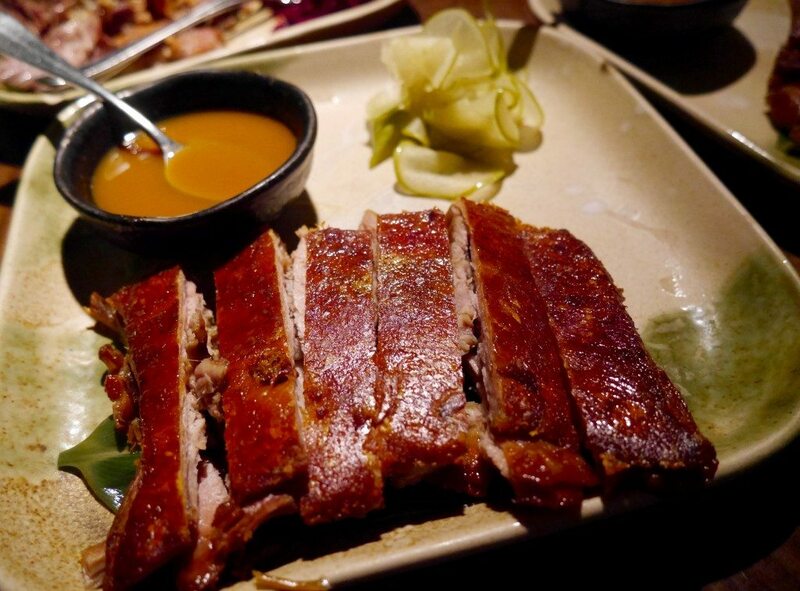 So disappointing that the duck was dry… but hooray for the pork saving the day hehe. Must have been a wonderful evening, now they just need to improve the decor a bit!